My name is Jae, I’m the new Digital Marketing and Communications Intern for Arts Connect. I am a multidisciplinary artist who works with a range of art forms, singing, rapping, music production and spoken word. I also do work as a workshop facilitator where I’ve explored a range of topics from writing spoken word poetry, songwriting, bath-bomb making and even body painting. I love art and digital- design, painting, curating and dressing spaces for events and workshops as well as freelancing as a hairstylist – basically anything that allows me to use the right side of my brain is how you’ll usually find me spending my time. My role here at Arts Connect is to support the digital marketing and communications activities of Arts Connect with a particular focus on developing social media reach and impact, creating assets for and running social and digital media campaigns, while learning the key skills of digital arts marketing to support my future career development. A mouthful – I know! Starting anything new can be daunting – being thrust into a brand new environment where everyone is armed with years of experience and a ton of acronyms can make you feel like a little overwhelmed initially. My first week I was in bed and asleep by 9pm and having dreams about brand guidelines. Arts Connect has a really small team and my Line Manager was very keen for me to have 1-1s with everyone in the team to get to know them better. On my first day, we had a team lunch – which was scary, but also really important. It’s the first time I’ve ever started in a role and management have made an effort right off the jump to make me feel included. Everyone here is lovely, really hard working, passionate about what they do and really efficient in responding to emails in record-breaking time. Since starting I have been getting to know the arts and cultural sector in a more in-depth way. I’ve been involved in arts activity in the West Midlands and London since 2013 but aside from short freelance contracts, development schemes and volunteering this is the first time I’ve been completely immersed in a company. I’ve researched into National Portfolio Organisations (NPOs) across the West Midlands and further afield, explored the ways that different companies interact with people online and built portfolios of different brand voices. Arts Connect was the second biggest contributor to the hashtag across England (only beaten by an organisation with 40k followers) we produced the most tweets, had the highest engagement of the whole year and had an increase of 31 new followers 300% more than a typical week at Arts Connect. Our most popular tweet had over 2000 impressions! Supporting the hard work that Felicity had already put into place and using my keen eye to explore how graphic design could influence the campaign really boosted my confidence and showed me what a massive difference a well thought out and smoothly executed campaign can achieve. In addition to digital based work, I have been meeting and networking with other digital marketing interns which has not only boosted my confidence and understanding of my role but also helped me to develop lasting connections which I can take with me during my internship and beyond. This month started off really busy for me. I went to London to see the launch of the new BBC Ten Pieces programme in London where we were treated to an exciting interdisciplinary performance and interpretation of classical music by some primary school children. 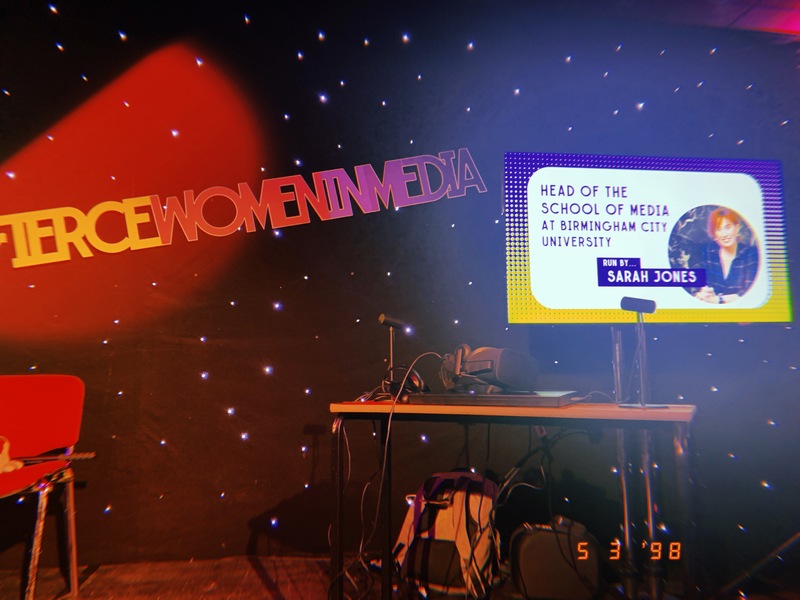 In celebration of International Women’s Day my next stop was the BBC Fierce Women in Media event in Birmingham where I got the chance to experience wearing a VR headset and learn some top tips for putting your best self forward when applying for industry roles. The last stop on the busy week was in Manchester for some Impactful Video Marketing training with the Arts Marketing Association (AMA) where I learned about the power that 5 shot sequences have in piecing together interesting and effective stories using an iPad and iMovie. It’s been an amazing month; jam-packed with learning and meeting a lot of really hardworking and passionate people. A statistic from the Sound of the Next Gen music report says that 86% of internships across the arts are unpaid. I feel excited and honoured to have been given the opportunity to build and learn with an employer who values young people and understands the richer and exciting ideas they can contribute, who cares about their personal professional development,and who sees the importance of giving them access to paid opportunities to open the gate to the world of careers within the creative industries. I’m looking forward to seeing where this journey takes me and where I’ll be a year from now. I’ll be recording my journey through this series of monthly blogs so check back this time next month to find out more about where this new adventure has taken me.